Smallest Apple Product will Get a Camera Soon! We all know that Apple’s iPod is at its 6th generation and has the magical touch screen based interface with a new compact design. 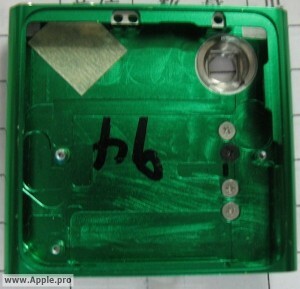 There was hope and speculation that the iPod will also have a camera built in to it but that did not happen. Well don’t be disappointed because the latest rumor is that the next Apple iPod Nano 7G will get a camera. Apple Pro posted some pictures that it claims is the real deal. The pictures it says belong to the iPod Nano 7G and shows a small aperture at the back of what looks like a iPod Nano chassis. Apple pro has had good luck in getting rumors converted to facts. It revealed correct details of several of previous Apple products including the iPad 2. Many think that this rumor might be a fact considering Apple wanting to increase its marketability of the iPods. This will be quite a great feat from Apple if it was able to achieve this. Imagine a tiny device with a camera. Apple has not commented on this yet but something tells us they will reveal some info pretty soon. Next-Gen iPod Nano – Smaller with Touch Screen! Weird – Apple Calls US Secret Service to Nab Spy Camera Artist! Next Disk Network Buys BlockBuster for a Steal!